Economy rates a pet-friendly policy and a non-smoking atmosphere are some of the inviting features of the Red Roof Inn Tinton Falls. The three-story non-smoking hotel provides 119 rooms featuring plush bedding flat-panel TVs safes and premium cable TV with On Command Video which offers a selection of pay-to-view channels and movies plus music and games. When it's time for your caffeine fix stop by the lobby where there's always a fresh pot of coffee and newspapers for guests to enjoy compliments of the house. One well-behaved pet per room is permitted without any additional charge. Wi-Fi is available. The hotel is off of the Garden State Parkway two miles from Monmouth Mall three miles from Fort Monmouth and four miles from Monmouth Park Racetrack. It's five miles to Monmouth University. Guests are 15 minutes from the beaches of Long Branch and 20 minutes from Naval Weapons Station Earle. 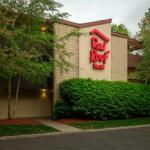 The Red Roof Inn is 30 minutes from Six Flags Great Adventure and 37 miles from Newark Liberty International Airport.